This past Sunday, we drove out to our property in the forest to walk around and see how it looks in the hazy, smoky wildfire weather that we've been experiencing this past week here just outside of Seattle, Washington. The smoke was so thick that the sun could only break through occasionally, but when it did the quality of the light became almost cinematic and orange-tinged. I didn't bring my camera out but I had my cell phone, so I took a few photos anyway. We're just about ready to submit our building permits and hopefully start building our house within the next year, but we're in no big rush and we're making sure to spend a lot of time on the house design before finalizing everything. The land we purchased is seven acres in an old logging forest with some evidence of old growth tree stumps. One particular stump and downed tree that we have is 600 years old! The majority of the trees currently standing are new growth evergreen trees, around 50-60 years old. 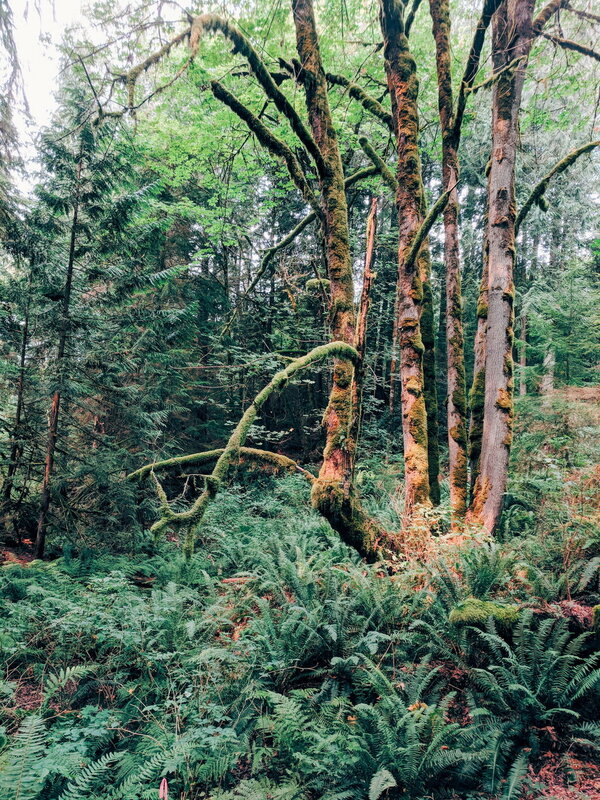 The climate in the Pacific Northwest makes our forest a temperate rainforest, full of lush ferns, evergreen trees, and moss blanketing everything. It can be a little difficult to traverse the land sometimes with the occasionally unstable, perpetually decaying forest floor. It's not quite mushroom season here yet- we usually see the most mushrooms/fungi here in October once the rains begin, but we did find a few on this particular walk. I'm not sure exactly what this one is, but it looks like a kind of shelf fungi. We have a wildlife camera tied around a tree facing a path that we, as well as many of the forest animals, frequently walk. We've seen black bears and deer so far, but we also have cougars, which we have yet to see, fortunately. When we got home in the evening, our bunny Violet, who is not used to spending much time alone, was very happy to see us and made sure she was the center of attention and cuddled with for the rest of the night. Anthony found himself with our video camera in a slow-motion setting at just the right moment to capture this very relaxed stretch and slightly terrifying yawn. We're staying inside now that the smoke has become much more thick over the past few days and trying to minimize the negative health implications of breathing in all of those particles, but it was interesting to see how it changed the light in the forest and spend a little time out in nature. I hope everyone else has had a relaxing weekend and that you're safe and far away from all of the wildfires and heavy smoke. I'll be back with more recipes (and recipe videos) very soon!